Keeping your kitchen cabinets looking clean isn’t as hard as you might think. After a while, you’ll begin to notice that your once beautiful and ornate wood cabinets have started to look a bit dusty. High-quality kitchen cabinets should last the test of time but still need some work done to them every once in awhile to keep them looking great. Don’t worry! Here at Johnson Lumber, we want to make the process as easy for you as can be. 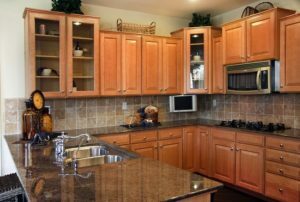 Check out our advice on how to maintain and clean wood cabinets in your kitchen. The best thing you can do is basic preventative measures. These little things will stop problems for spiraling out of control and leaving you with serious wood cabinet cleanup to perform. If you spill something on your cabinets, clean it up as soon as you can. There’s nothing worse than finding sticky residue on a cabinet months later and being unable to properly clean it then. Also, you’ll want to wipe your wood cabinets down with a cloth every once in a while too. If your kitchen cabinets require cleaning, fret not. It’s easier than many homeowners think. Simply take a clean, damp cloth and wipe down the cabinets. If that’s not doing enough, use a mix of dishwashing liquid and warm water. Once you’re done wiping the cabinets down completely, try drying them with another soft cloth just by rubbing them gently in the direction of the grain. When dealing with glass panels, avoid spraying glass cleaner right onto the glass itself. First, spray your cloth, then wipe your kitchen cabinets down afterward. Cleaning kitchen cabinets is pretty easy, sure, but that doesn’t mean there aren’t things to avoid. Harsher cleaners are capable of breaking down the coatings of finishings on cabinets which may leave them looking unsightly. Scrubbing too hard, or just using overly abrasive pads, could also do damage to the finish. After you’re done cleaning, be sure not to leave any damp materials on your kitchen cabinets or it could cause issues. This entry was posted on Friday, November 10th, 2017 at 10:57 am. Both comments and pings are currently closed.